In recent days President Trump has, yet again, ludicrously asserted that millions of people illegally voted against him last November. Lies of such magnitude and consequence from the White House certainly deserve the attention and scorn they've received. After all, once we move beyond the realm of "alternative facts," the real evidence shows that a person is more likely to be struck by lightning than to impersonate someone else at the polls. But to fully understand Trump's complaints about "illegal voters," we need to recognize that voter fraud and voter suppression are opposite sides of the same coin. By promoting beliefs about the former, the groundwork is laid for pursuing the latter. In this way, tales of unlawful voting have long been a pretext for obstructing the voting rights of U.S. citizens. The mass manipulation at the heart of this strategy relies on what I call the "combating-injustice mind game." With two steps, this psychological ploy preys upon the public's acute and compassionate sensitivity to issues of right and wrong. First we're bombarded with dire warnings that something terribly unjust is happening. These overwrought claims aim to spur broad outrage and demands for reform. Then the propagandists step forward with carefully crafted proposals for how to address the purported injustice. But there's a catch. Their recommended changes are designed with a very different goal in mind: to advance a narrow self-aggrandizing agenda, one that leaves those who were already disadvantaged even worse off than before. So, behind the seductive façade of combating injustice, wealth is extracted, power is entrenched, and the common good is trampled. In short, complaints of rampant voter fraud are really just an elaborate cover story, constructed to hide repugnant attempts to gain electoral advantage by disenfranchising Americans. Paul Weyrich, for decades a leading voice of the conservative movement, indirectly acknowledged as much almost fifty years ago. In a speech in Texas back in 1980, he explained, "I don't want everybody to vote. "Our leverage in the elections, quite candidly, goes up as the voting populace goes down." That master plan hasn't changed in the intervening years. 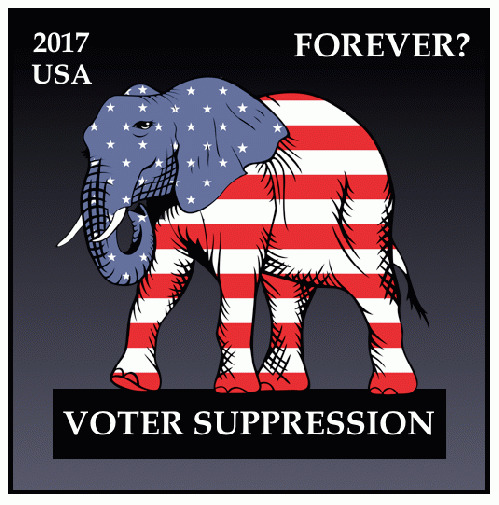 That's why the Republican Party's 2012 platform emphasized, "Every time that a fraudulent vote is cast, it effectively cancels out a vote of a legitimate voter"; why Reince Priebus, now Trump's chief of staff, has argued that requiring a photo ID at the voting booth is "fair, reasonable, and just"; why other right-wing mouthpieces insist we must "keep fraudsters away from polling places" and "vote fraud pervades our election process"; why True the Vote, the Koch-funded Tea Party outfit, cunningly describes itself as "regular citizens standing up for fair elections"; and why the GOP's 2016 platform endorsed legislation calling for both "proof of citizenship when registering to vote and secure photo ID when voting." It's no surprise that the favorite targets of voter suppression efforts include African Americans, Hispanic Americans, students, and low-income workers. That's because most members of these groups are traditionally unlikely to vote Republican. They're also less likely than most Americans to have a driver's license or other valid photo ID.